All Codes used in this article is downloadable from this URL. 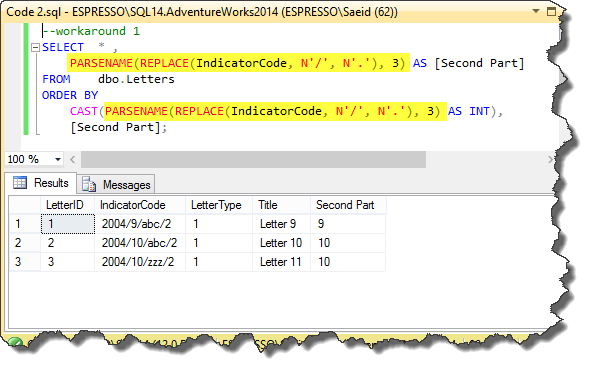 This article’s aims to demonstrate a known issue in SQL query execution, and two general workarounds to solve this issue. Although this issue has at least two workarounds, it is a good idea to vote for a fix in the above URL. Also, please add your ideas about this issue in the comments. 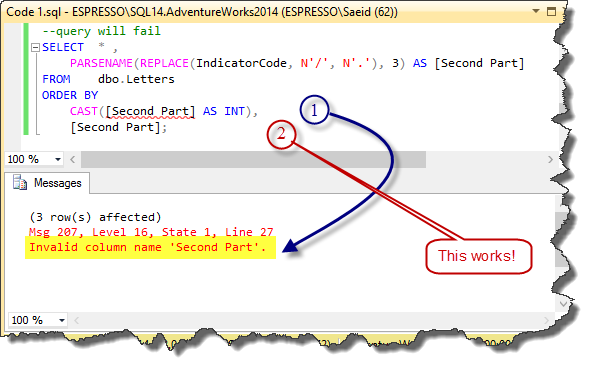 The following steps show the logical processing order, or binding order, for a SELECT statement. This order determines when the objects defined in one step are made available to the clauses in subsequent steps. For example, if the query processor can bind to (access) the tables or views defined in the FROM clause, these objects and their columns are made available to all subsequent steps. 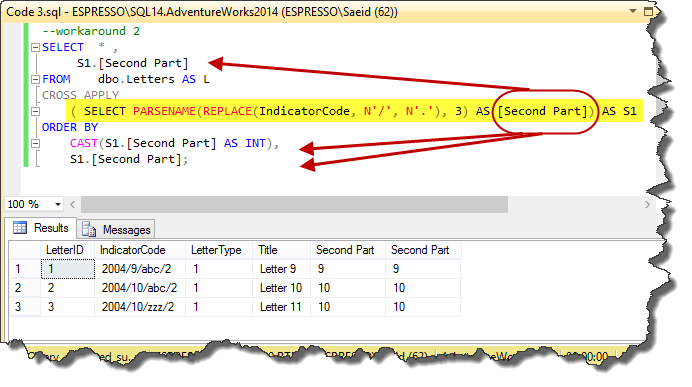 Conversely, because the SELECT clause is step 8, any column aliases or derived columns defined in that clause cannot be referenced by preceding clauses. However, they can be referenced by subsequent clauses such as the ORDER BY clause. Note that the actual physical execution of the statement is determined by the query processor and the order may vary from this list. 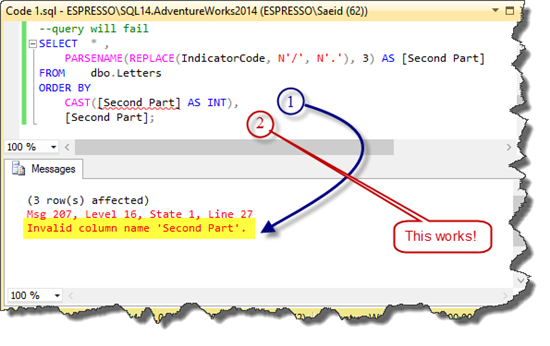 As illustrated in the picture_01, the error message occurs because of using the alias in the first calling. If we use it alone, like the second line of the Order By clause, it works. The whole code and the result is showed in the picture_02. 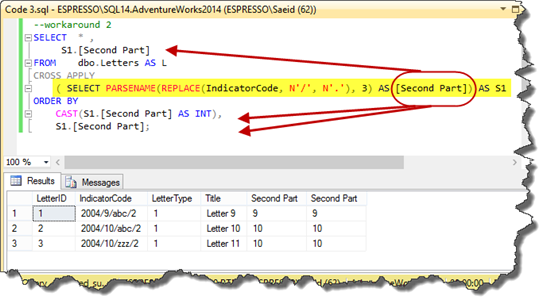 In this code, we just duplicated the code instead of using the alias in the first column in the ORDER BY clause. The second point is that we refer the alias whenever we can. This is why we used the alias in the second line of the ORDER BY clause. As illustrated in the following picture, in this solution, we use the computation column code in the CROSS APPLY phase. Then, we can use it in the SELECT clause and also in the ORDER BY clause without any problem. This is a much cleaner technique than duplicating code and therefore likely to be the preferred choice. 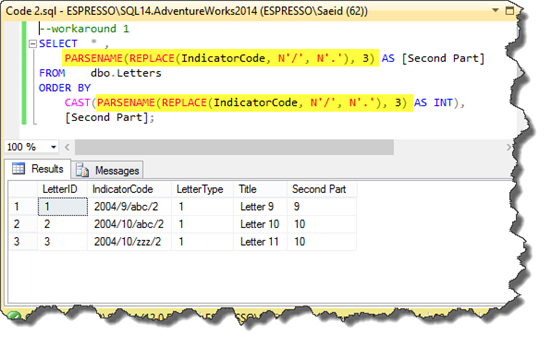 This article shows a known issue in SQL query execution, and two general workarounds to solve this issue. There are other solutions like using Views or Sub Queries. But, these two solutions are easy to use and the second one is the cleanest one.